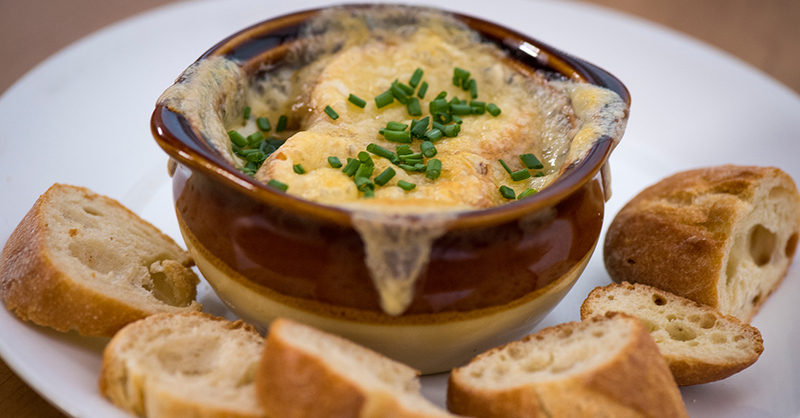 We still marvel at how some recipes with the simplest ingredients can taste so amazing, and French onion soup is no exception. This soup has such rich flavor thanks to it’s main ingredients (beef broth and onions) and it’s low and slow cooking method – we even enlisted the help of our slow cooker for this particular version to make it that much easier. We finish ours off the traditional way, topped with a slice of bread and melted cheese, making it one of our all time favorite comfort foods that warms us up from the inside out! Place chopped onions, butter, and olive oil in a large skillet or pot, and cook over medium heat for 10-15 minutes, or until onions start to caramelize. Transfer onions to slow cooker. Pour in beef broth, bay leaf, salt, pepper, and flour mixture, and stir well to combine. Ladle soup into oven proof bowls, top each with 1 slice of bread and cheese, and broil, about 5 minutes or until cheese is melted and bubbly. Garnish with chives, serve hot and enjoy!